Before starting, I read more of Aesop's fables, but I couldn't find anything just right. Then I thought of the fairy tale, "Little Red Riding Hood." Aha! 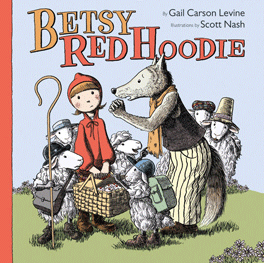 The original Little Red is easily fooled, but Betsy would never stop to pick flowers at the suggestion of a wolf in stranger's clothing. And she'd smell a rat—or a wolf—the moment she stepped into her grandmother's cottage. However, she might be betrayed by her best friend, Zimmo, the wolf. It has been great fun to see what Scott Nash comes up with in his illustrations. Who would expect a wolf in striped pants and a vest or backpack-toting sheep in stout shoes and hats? One musical sheep even plays the guitar!